Maybe you have been aware of that the living room in your house is somewhat too dim, the walls and furniture are pale and monotonous, although they are comfortable but absent of colors and vigors. Now in this article we enlarged the problems of a living room specifically, and put forward two schemes to rebuild a nice living room, you will see the comparison before and after, and the living room will become a place full of colors and charms, and become a beautiful and nice space for gatherings of you and your family members and your friends, and let you could enjoy more memorable time. 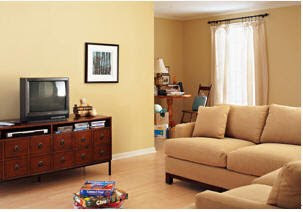 Dull beige walls, comfortable but less vigorous furniture, simple decorations and home furnishings, all make this living room looked quite far to a nice home. But there are still some good elements, as long as it taken some rational reconstruction, the living room should be become very attractive and lightful. There is no coffee table in front of the sofa, so you will feel somewhat unconvenient when sitting on the sofa chatting and watching TV. 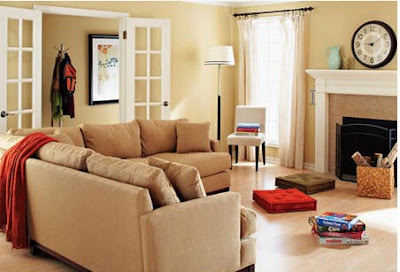 And all things in the room are looked not enough relax and comfortable, this living room is need more colors, patterns, and soft corners which could make you become relaxing. 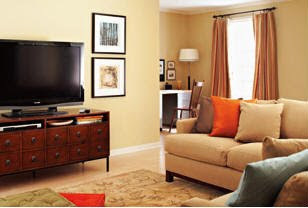 Corners of the room are special nooks of the home, which could be used for storing or other purposes. The corner of this living room is sufficient with sunlight, so it is entirely competent to act as a multi-functional workstation, rather than just been placed with a breakfast table and a number of books on correspondence merely. The storage of goods in the living room seemed to has some problems, family members will be readily placed their schoolbags, clothing, sporting goods, toys and DVDs by random. There is no suitable space for storage, so everyone only put things by random and without much order.